At times suffers from dull, dunderheaded, or dead-end plotlines [but]...There's enough here to keep hope alive that Gotham could grow into more of a weekly treat than a fanboy obligation. 968 min. FOX. Directors: Danny Cannon, Dermott Downs, TJ Scott, Tim Hunter, Rob Bailey, Paul Edwards, Karen Gaviola, Guy Ferland, Oz Scott, Eagle Egilsson, Wendey Stanzler, John Behring, Nick Copus, Jeffrey Hunt, Nathan Hope, Bill Eagles. Cast: Ben McKenzie, David Mazouz, Donal Logue, Robin Lord Taylor, Sean Pertwee, Cory Michael Smith, Jada Pinkett-Smith, John Doman, David Zayas, Erin Richards, Zabryna Guevara, Camren Bicondova, Victoria Cartagena, Morena Baccarin, Nicholas D'Agosto, Drew Powell, Andrew Stewart-Jones, Chris Chalk, Cameron Monaghan, Peter Scolari, Colm Feore, Dan Hedaya, Lili Taylor, Frank Whaley, Richard Kind, Isiah Whitlock, Jr., Christopher Heyerdahl, Julian Sands, Charlie Tahan, Mark Margolis, Jeffrey Combs, David O'Hara, Milo Ventimiglia, Daniel Davis, Carol Kane, Allyce Beasley. Origin stories. With so much of the successful franchise material feeling overworked in reboot after reboot, freshly reimagined origin stoies—along with ever-expanding universes—essentially allow companies to multiply their franchise value. Ever since DC Entertainment trailblazed a new era of superhero television shows with Smallville, which ran a full decade on The WB and The CW, rumors have persisted of a "young Bruce Wayne" show, and last season on FOX, it finally arrived in the form of Gotham. Where Smallville's title was often a misnomer (as the show followed Clark Kent to Metropolis), Gotham's ambitious format seeks to tell the story of Gotham City, along with its famous and soon-to-be infamous denizens. Developed from the DC Comics by Bruno Heller—whose previous creator credits (Rome, The Mentalist) suggest Gotham's best and worst tendencies—Gotham mostly concerns three spheres of influence on the city: the Gotham City Police Department, where Detective James Gordon (Ben McKenzie) rages against corruption while trying to protect and serve; Wayne Manor, home to cruelly orphaned pre-teen Bruce Wayne (David Mazouz) and his butler/guardian Alfred Pennyworth (Sean Pertwee); and the criminal underworld, dominated by mob bosses Carmine Falcone (John Doman) and Sal Maroni (David Zayas) but prone to ruthless strivers like Fish Mooney (Jada Pinkett Smith) and Oswald Cobblepot (Robin Lord Taylor), soon to be known as The Penguin. As with arguably the most critically acclaimed narrative TV series ever, The Wire (from whence Doman came), these spheres--along with City Hall politics and Arkham Asylum's mental healthcare failure--overlap in a kind of weekly Venn diagram that, at its best, serves as a thoughtful social critique about what ails our urban centers. Also skulking around Gotham are longtime Batman characters Falcone; Maroni; cat-loving street kid Selina "Cat" Kyle (Camren Bicondova); Edward Nygma (Cory Michael Smith), here a forensic scientist for the GCPD whose hobby is riddles; current good guy/future bad guy A.D.A. Harvey Dent (a miscast Nicholas D'Agosto); mad, mad, mad, mad Victor Zsasz (Anthony Carrigan); teen Jonathan Crane (Charlie Tahan); as well as versions of The Electrocutioner (Christopher Heyerdahl), The Ogre (Milo Ventimiglia of Heroes), the Red Hood, and the Dollmaker (Colm Feore). Kyle will one day be Catwoman, Nygma the Riddler, and Dent Two-Face; plus, there's the presumably-Poison Ivy-to-be Ivy Pepper (Clare Foley) and a mentally deranged, suspiciously Joker-like character played by Cameron Monaghan (Shameless), characters who may or may not be red herrings. It's no surprise that Gotham has drawn criticism for biting off more than it can chew in its first batch of twenty-two episodes. Those criticisms are fair. Less fair, but understandable, is the desire of some die-hard Batman fans for the show to be what it isn't: i.e. the acclaimed 2002-2006 monthly comic Gotham Central, which backgrounded the adult Batman to create a police procedural at the GCPD. Had the show gone that once-rumored route, it would have probably been considerably more interesting and artful, but struggled proportionally in the ratings department (as it is, Gotham isn't yet a slam-dunk hit for FOX). So let's take the show on its own terms: Gotham at times suffers from dull, dunderheaded, or dead-end plotlines; uneven performances; and chronic distraction from the stuff that works by the stuff that doesn't. So what works? The show's top-notch production design of ornate interiors and well-chosen, CGI-enhanced NYC locations make a convincing world unto itself for Gotham (and close neighbor Wayne Manor), Taylor offers a breakout performance as Penguin (while vets Doman, McKenzie, Logue, and Smith turn in solid work), and when the show zooms in to focus on a tight, nasty little short story (of the kind that fills the pages of a monthly comic), it often delivers some entertaining Grand Guignol. Under pressure to do so, the show gives young Master Bruce too much agency, making him at times a ridiculous prodigy instead of a believably human grieving child (an even more ludicrous storyline has Kean hanging out at length with "Cat" and Ivy). But episodes like "Rogue's Gallery" (with its creepy Arkham Asylum mystery adventure) and "Red Hood" (with its Dark Knight-esque exploration of urban crime and the liberation of the mask) show the sort of show Gotham can be. Ironically and not surprisingly, they're the kind of shows that could easily have been Gotham Central stories: reasonably focused, memorable crime tales instead of stews of obvious show-mythology or padding. The show can be surprisingly violent, even venturing into body horror with the Dollmaker, but Gotham is never more compelling than when it sticks to plausible crime drama. Among the show's many, many conscious cinematic influences are the Nolan Batman films (natch), Heat, L.A. Confidential (McKenzie's Gordon feels like a mash-up of the Guy Pearce and Russell Crowe characters), Serpico, and film noir. And the show almost feels as if it were tapping that elusive David Simon-y vein when it reveals that corruption runs as deeply through Wayne Enterprises as the GCPD. There's enough here to keep hope alive that Gotham could grow into more of a weekly treat than a fanboy obligation. 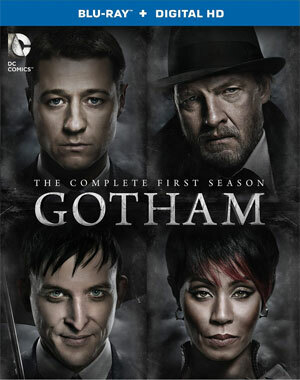 Warner has put together an impressive inaugural Blu-ray + Digital HD season set for Gotham: The Complete First Season. The winningly cinematic A/V specs inspire awe. Sharp, detailed, glossy, and richly hued images come perfectly calibrated in black level and contrast, with beautiful depth and delineation, while the DTS-HD Master Audio 5.1 mixes thunder musically and pack punch into the frequent action scenes without ever sacrificing the clarity and coherence of well-placed effects and nicely prioritized dialogue. Across Discs Two, Three, and Four, you'll find Deleted Scenes (HD) for "Penguin's Umbrella," "Lovecraft," "Rogue's Gallery," "What the Little Bird Told Him," "Welcome Back, Jim Gordon" and "Beasts of Prey." The three-part making-of documentary "Gotham Invented" kicks off with "Gotham Invented: Building Our Gotham" (13:19, HD), which explores the conception, design, and execution of the latest iteration of Gotham City using behind-the-scenes footage, clips, and interviews with executive producer Bruno Heller, DC Entertainment Chief Creative Officer Geoff Johns, executive producer Danny Cannon, executive producer John Stephens, writer Megan Mostyn-Brown, Robin Lord Taylor, David Mazouz, and Sean Pertwee. The doc develops with "Gotham Invented: Paving the Way for the Caped Crusader" (6:56, HD), with Johns, Cannon, Mostyn-Brown, Stephens, writer Rebecca Perry Cutter, Milo Ventimiglia, Donal Logue, Ben McKenzie, and Taylor discussing the functions of the show's origin stories; and finishes with the self-explanatory "Gotham Invented: Fractured Villains of Gotham" (11:13, HD), featuring the commentary of Johns, Cannon, Heller, Mostyn-Brown, Cutter, Ventimiglia, McKenzie, and Stephens. "Gotham: Designing the Fiction" (20:01, HD) finds Johns, Logue, Taylor, Heller, McKenzie, production designer Richard Berg, John Doman, Stephens, Cannon, and director of photography Christopher Norr going deeper into story development, production design, and photography. "Gotham: The Game of Cobblepot" (26:25, HD) allows Heller, Taylor, Stephens, Mostyn-Brown, McKenzie, and Cutter to analyze the Penguin's long game over the course of the season. "Gotham: The Legend Reborn" (21:37, HD) is a half-hour promotional special with its commercials subtracted. An introduction to the show's mythology that also reveals behind-the-scenes secrets, the special also includes interviews with Heller, McKenzie, Johns, Cannon, Logue, Taylor, Jada Pinkett Smith, David Mazouz, property master Peter Gelfman, production designer Doug Kraner, director of photographer David Stockton, art director Laura Ballinger Gardner, stunt coordinator Norman Douglass, visual effects supervisor Tom Mahoney, special effects coordinator Mike Myers, and Erin Richards. "DC Comics Night at Comic-Con 2014 Presenting Gotham, The Flash, Constantine and Arrow" (29:31, HD) trims down DC's massive panel event to its highlights, as Johns moderates a Q&A (including some audience questions) with Heller, McKenzie, Logue, Pertwee, Taylor, Richards, Mazouz, Camren Bicondova, Zabryna Guevara, Cory Michael Smith, Victoria Cartagena, Andrew Stewart-Jones, Jada Pinkett Smith, Cannon, and Stephens of Gotham; executive producers Greg Berlanti and Andrew Kreisberg, director David Nutter, Grant Gustin, Candice Patton, Rick Cosnett, Danielle Panabaker, Carlos Valdes, Tom Cavanagh, and Jesse L. Martin of The Flash; Matt Ryan, Harold Perrineau, Charles Halford, and executive producers Daniel Cerone and David S. Goyer of Constantine; and Stephen Amell, Katie Cassidy, David Ramsey, Emily Bett Rickards, Colton Haynes, Willa Holland, Paul Blackthorne, John Barrowman, and executive producers Greg Berlanti, Marc Guggenheim, and Andrew Kreisberg of Arrow. Comic-Con panels can be hit or miss, but they're always interesting in some way, and this one's no exception (though Smith is on complete cruise control when Johns asks her a question). Character Profiles are short promotional pieces comprised of clips and talking heads: "Detective James Gordon" (2:29, HD) with McKenzie, Heller, Johns, and Logue; "Bruce Wayne and Alfred Pennyworth" (2:34, HD) with Heller, Mazouz, Cannon, and Pertwee; "Detective Harvey Bullock" (1:35, HD) with Logue, Heller, Johns, and McKenzie; "Fish Mooney" (1:39, HD) with Smith, Heller, Johns, and McKenzie; "Oswald Cobblepot" (2:05, HD) with Taylor, Heller, and McKenzie; "Dr. Leslie Thompkins" (2:07, HD) with Baccarin and McKenzie; and "Killer Characters" (2:57, HD) with McKenzie, Cory Michael Smith, Baccarin, and Logue. Rounding out the set is a "Gag Reel" (4:55, HD) with the cast taking turns flubbing lines. All site content © 2000-2019 Peter Canavese. Page generated at 04/20/2019 09:14:10PM.